Custom reports are available on the Enterprise plan. You can create custom reports with charts in your ActiveCampaign account. These reports can help you analyze information and answer specific questions you and your team may have around data or certain activities. When you create a custom report, you can save it to your account so you can access it at any time. 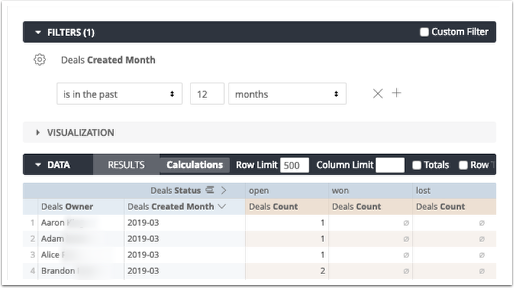 In this article, we'll show you how to create a custom report that shows you all deals won, lost, and open by deal owner. 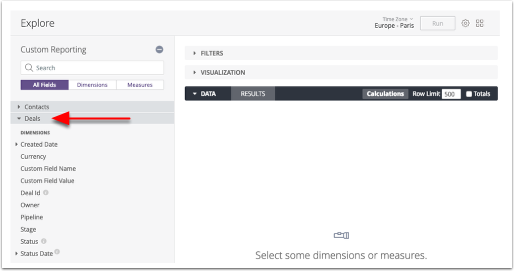 Dimensions describe data in your account. For example, contact name, contact ID, or city. A collection of data elements. Each report you create and save is called a Look. 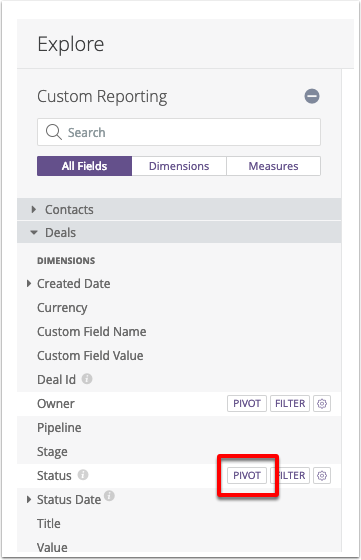 The custom reporting tool is located on the Reports section of your account. This is listed in addition to your standard reports. To access the reporting tool, click "Reports" in the left menu. Then click "Custom Reports." 1. Click the "Deals" located under Explore. This will expand the "Deals" view. 2. Next, you'll need to add an Owner dimension to the report. 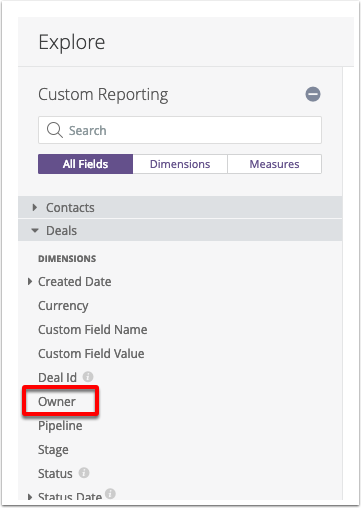 To do so, click the "Owner" option located under "All Fields > Deals." 3. Now you'll need to add a Status dimension to the report. 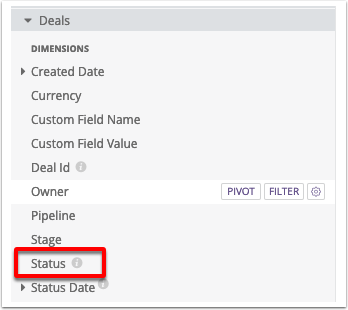 To do so, click the "Status" option located under "All Fields > Deals." 4. Now you'll need to pivot the report by status. To do so, click the "Pivot" button that appears next to "Status." 5. Next, you'll need to add a Count measure to the report. 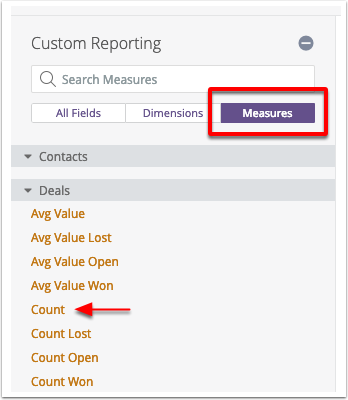 To do so, click the "Measures" tab then click the "Count" option located under "Deals." 6. You'll now need to add a Time Filter to the report. Click the "Dimensions" tab then click "Created Date" under "Deals." The date menu will expand. Hover your mouse over "Created Month" and click the "Filter" button. 7. Change the Time Filter. 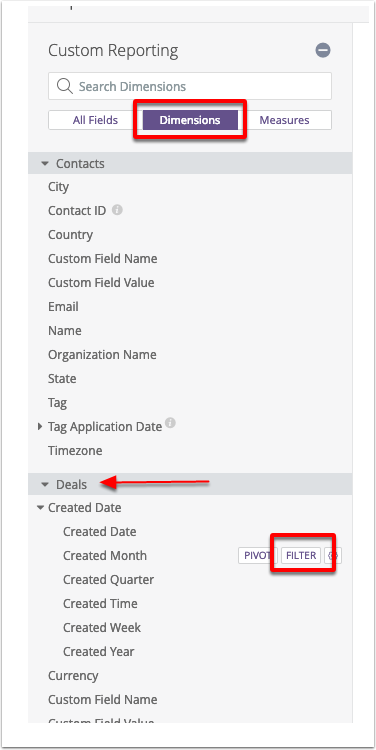 Navigate to the "Deal Created Month" filter located under the "Filters (1)" header and type "12" into the second box. 8. Click the "Run" button located at the top of the report. The data will render in a table format. Once you run the report, you can add a chart to it to provide a visual representation of the data. To do so, click the "Visualization" header to expand it then click the "Column" option. 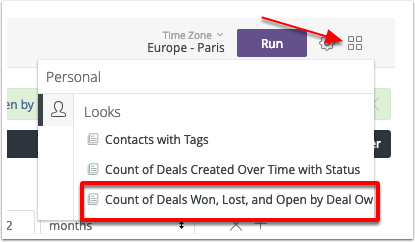 Once you create your custom report and add your chart, you can save the report in your account so you can pull it up later. To do so, you'll need to save this report as a "Look." 1. 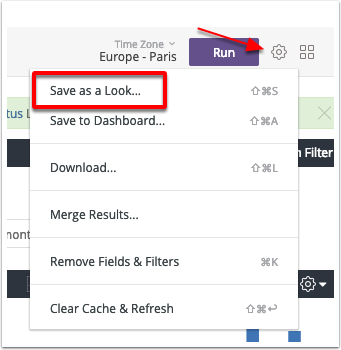 Click the gear icon located next to the "Run" button. 2. Click "Save as a Look..."
3. In the "Title" field, type a descriptive title. For example, you can type "Count od Deals Won, Lost, and Open by Deal Owner." The report will be located in the Custom Report menu under "Looks." To access it, click the menu icon located next to the gear icon in the report, then select the Look you wish to view. How do I use a custom domain name (CNAME)?